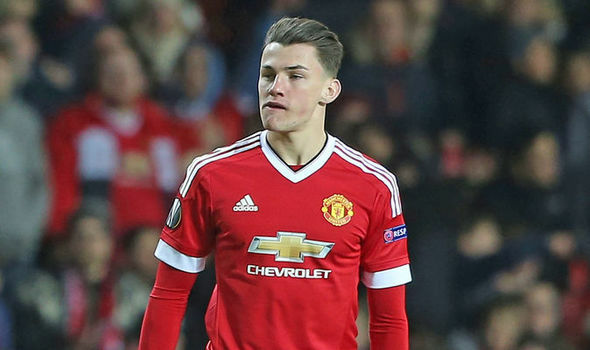 Regan Poole has made one appearance for Manchester United. Regan Poole is hoping his loan spell at Newport County will lead to an extended contract at Manchester United and a return to the Wales Under 21 ‘WhatsApp’ group. The 20-year-old defender went back to his roots this season with his return to Rodney Parade looking to get more league games under his belt in a bid to convince his United bosses to take up the one year option on his deal at Old Trafford this summer. He has played every minute of every game since returning to the Exiles in January and has impressed everyone with his mature displays at the back. Picked out for stardom as a 17-year-old when United paid £100,000 for him from Newport, he has made one first-team appearance for United. That came in the final minute of a 5-1 home win in the knockout phase of the UEFA Europa League against Danish side Midtjylland on 18 February, 2016. A regular for the reserve team, he went out on loan to Northampton Town last season as is now battling for an extension to his contract. A Wales regular at age group level, Poole has seen many of his international team-mates win full caps and play regularly in the Premier League and Championship. “I’ve played with the likes of David Brookes, Ethan Ampadu and Dan James for a long time now and it is great to see them going on and playing every week,” said Poole. “What more can you ask for at such a young age. They have kicked on, are getting their chance in the Prem and for Wales and that’s the aim for me. “Some of them are my friends and it’s great seeing them doing so well. Dan James scored the other day, so it’s great. “The What’s App groups have moved on though now they are first-team regulars. I don’t speak to them as much as I used to, so it will be great when I get a message saying Regan Poole has been added to the group again. Poole has yet to speak to new United boss Ole Gunnar Solskjaer, but is in constant touch with the club’s loan department. Next week sees the Red Devils heading into a Champions League quarter-final clash with Barcelona and Poole was delighted to see some of his academy colleagues getting a run in the 3-1 win over PSG in the last round. Solskjaer introduced the 20-year-old Portuguese defender Diogo Dalot, 19-year-old Dutch midfield Tahith Chong and 17-year-old young England starlet Mason Greenwood off the bench in Paris and Poole is hoping the club’s renewed commitment in youth will give him the chance to add to his one first-team appearance. “I’ve played once for Manchester United and my aim is to wear the shirt many more times. That was the goal from the first day I arrived there,” said Poole. “I played when I was 17, when I didn’t expect to get my chance under the old manager, and hopefully something will now happen for me under the new one. My contract is up at the end of the year and they have an option on me for another year, so it could be a big summer for me. “I’ve been speaking to the loan department at Man United every week and after every game. I haven’t spoken to Ole, but as long as word gets back to him I’m happy. “I know he watched the Man City game, so that’s good. Every young player needs to go out on loan to help them move on and I’m learning with every game. In the meantime, he is just happy to be back at Newport and doing his best to help them move as high up the League Two table as possible. “I came to Newport to try to help them get promotion and we’ve still got a chance. We feel we can beat any team in the league at the moment,” he added.